Today we’re doing something simple but useful: turning off BombSquad’s player limits. I’ve gotten asked how to do this a fair amount so I thought it’d be worthwhile writing it down. I built BombSquad’s engine to support *any* number of local players, but I decided to put in limits of 4 for co-op and 8 for teams/free-for-all so that I could ensure everything works cleanly with those numbers. Removing the limits and playing with more than that should work fine but is not officially supported, so please don’t be upset if you see little problems like player lists running off the edge of the screen or if your OUYA/Mac explodes from the insanity of it all and burns your house down. First off, make sure you’ve gone through tutorial #1 so you know how to issue python commands to BombSquad. If you entered everything correctly you shouldn’t see any errors …and we’re done. We just stored a few values in BombSquad’s config dictionary and told BombSquad to write its config to disk. Now you can gather up 3o or so friends, install BombSquad-Remote on their phones, and have the biggest BombSquad battle in history. 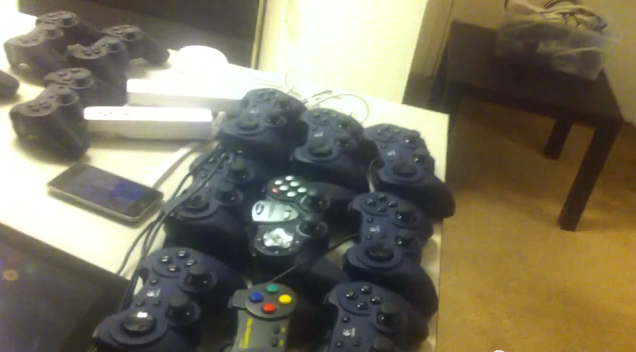 Here‘s a dorky video I made a few years ago while developing the game showing my personal record of 24 gamepads in one game. If you can top that, you have my eternal respect. Well, that’s it for this round. Tune in next time and we’ll do something fancier like starting to build a new mini-game. first: your game is awesome and the whole family is hooked! second: have you thought about enabling 3D vision on the Ouya? I’ve run some test code and it appears that Nvidia’s stereo utils lib is missing from Ouya’s current firmware. Bugger! So Eric I just tried running a “dedicated server” on my phone all night by simply disabling the screen timeout and just leaving run a 9 player multiplayer party. I was not aware of pc dedicated servers but I’m going to attempt to run one. And if possible mod my way into increasing the max player limit to 12 or 24. I wonder what could happen. Keep an eye out FOR a servers called “DukeofLeet’s Temporary Server” I will attempt to run more. Sounds good! Give me a holler at support@froemling.net if you run into any problems. And keep an eye out for updates – the server stuff will be changing a lot over the coming weeks as I’m adding features..